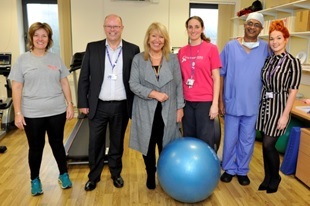 A gym has recently opened at University Hospital Llandough to help those having treatment for breast cancer feel fitter, stronger and improve their confidence. Cardiff and Vale Health Board Chief Executive Len Richards, and Chair, Maria Battle visited the McCarthy Suite at the Breast Centre in University Hospital Llandough to meet Victoria Collins, Senior Physiotherapist, Mr Sumit Goyal, Consultant Oncoplastic Surgeon and some breast cancer patients using the facility. The McCarthy Suite is a gym facility which was equipped with funds raised for the Breast Centre Appeal by Irene Hicks BCAv in memory of her three sons. The purpose of this gym is to provide prehabilitation and rehabilitation for those having treatment at the Breast Centre. This service is proving so popular with their patients that the service now needs a Physiotherapy Assistant, who will be funded through the Breast Centre Appeal to meet demand and to ensure that all patients having treatment for breast cancer can benefit from this incredibly valuable service. Victoria said: “The uptake for this service has been really positive, with patients engaging from the very beginning, at the point of diagnosis. “We are promoting exercise as a recognised treatment with significant benefits, both in the short and long term.